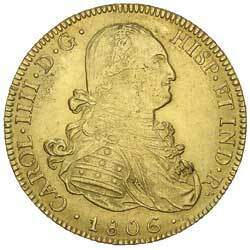 BOLIVIA, Charles IIII, eight escudos, 1806PJ, Potosi Mint (KM.81). Extremely fine. BELGIUM, Albert, twenty francs, 1914 (KM.78). Nearly uncirculated. BELGIUM, Albert, twenty francs, 1914 (KM.79). Uncirculated. 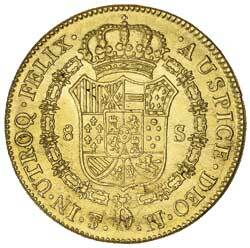 BRAZIL, Peter II (Pedro), four thousand reis, 1699 (KM.99, Fr.21). Very fine.